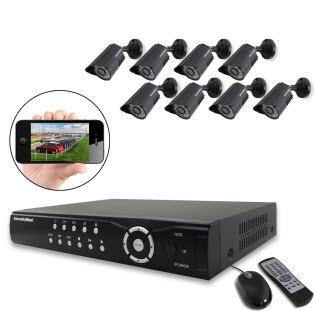 The Securityman NDVR8-320K is an 8 camera network digital video recorder surveillance kit designed for home and business use. The cameras (SM-218) can be installed outdoor/indoor for day time or night time recording and they have IR LEDs for no or low light situations. The NDVR8 8 channel DVR uses H.264 video compression for producing clear digital video recording and smoother/faster video streaming over the internet. Furthermore it is equipped with auto ID plug & play software making setup easy without network knowledge or configuration. Additionally the NDVR8-320K surveillance package comes with either a 320GB, 500GB, or 1TB HDD, and it can record up to 22 days under normal quality with 1TB. On top of all that you can monitor your home/business remotely anytime via Smartphone or PC almost anywhere in the world. All of this for only $799.99. What a great deal! Securityman also has a wireless 4 channel security system available with fewer features but at a lower price as well.